An eo bike at The Garage, where the company was founded. The student-run bike-share has placed 40 bikes around campus. 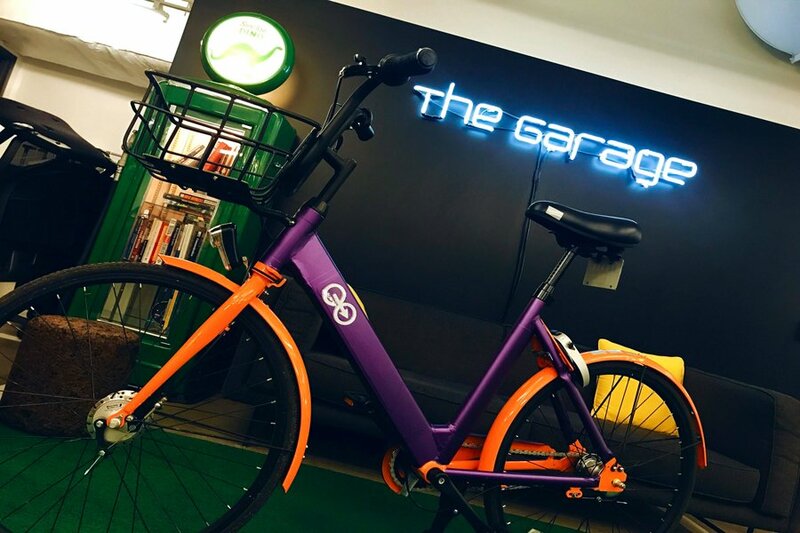 With the beginning of spring quarter and the hope for more sunny days, eo, a student-run startup at Northwestern, has launched its bike-share program on campus. The eo team, comprised of five undergraduate students, believes that mobility around campus is a lot harder than it should be, leading them to pitch a dockless bike-share model at Improve NU earlier this year. The group’s second-place finish at the competition gave them the seed funding of $3,500 to kickstart their project. The team has spent over a year working to develop a system that facilitates short, inter-campus rides so that students can get to their classes faster and save time that would otherwise be wasted on commute, Grace Jaeger, a Medill sophomore and eo member, said. They collaborated with a third-party tech provider, Koloni, which supplied them with the bikes that are currently being rented. They also have an app to display the user with the nearest available bikes. The eo team initially designed a custom prototype bike that could be picked up and dropped off anywhere on campus. Collaborating with Kolani, they have now placed 40 bikes in 21 hubs across campus from places such as Allison Hall and the Frances Searle Building. “We really wanted to make sure we were supplying bikes to all areas because we know that kids at this school are all over the place,” Jaeger said. The bikes have been painted with a shade of purple so that they stand out and also to exuberate school pride, she said. Weinberg sophomore Amelia Russo said she has had positive experiences using the bikes this week. McCormick freshman Candace Pang, however, experienced some difficulties. She said the app was “finicky” when she tried to use it and she had trouble finding a bike. She said the bikes do cut down the commute from North to South campus, but that users should factor in some wait time. Making eo affordable has been a priority for the team, Jaeger said. An early bird promotion offered unlimited rides throughout the quarter to all members who signed up before April 1 for a discounted fee of $20. Otherwise, the membership fee is $30 for an entire quarter. Rolling monthly memberships will also be offered soon. Additionally, students can use the bikes for a single ride for $2 per hour, which is significantly cheaper than the $6 per hour that Divvy bikes, the other alternate currently available on campus, costs. The eo team has also received advice from SustainNU. The environmental group is working to increase bike ridership by 10 percent by 2021 in order to promote sustainable alternates on campus. Talking about initial obstacles faced by the team, Jaeger said working with a third-party tech provider meant that they could not customize their bikes as much as they wanted. She also mentioned the team spent a long time negotiating with University officials about issues like user responsibility. Despite that, Jaeger said eo has now received responses from 80 members and around 305 rides in their first three days. Talking about their future plans, Jaeger said the ultimate goal would be to expand eo into a nation-wide bike-sharing program and to introduce it to campuses that are striving to create a more sustainable commuting option for their students. “Feedback has been great and we are very proud of all the effort that we’ve put in,” she said.